Topic 1 : How might games be used to develop a more socially inclusive classroom or workplace using Gee’s viewpoint? A socially inclusive classroom endeavours to meet the individual needs of all students (Cologon, 2015). Students are encouraged to learn together with guidance from the teacher who utilises a variety of resources. Games are one such resource that a teacher could employ to cater for the diverse learning needs within a class. Initially, teachers, such as myself, who have had little experience playing video games may see barriers and tensions rather than opportunities. The traditional role of the teacher is challenged when video games are used in the classroom (Sandford, Facer & Williamson, 2011) and this can be unsettling. At first, barriers such as technology infrastructure and the time required to learn about games seem insurmountable. However these barriers can be overcome if teachers are willing to rethink their teaching (Becker, 2011). According to James Paul Gee, good games incorporate learning principles that can be have a positive impact on education (Turkay, 2014). Gee asserts that video games entertain and motivate people through challenge and learning. Gee’s viewpoint is backed up by cognitive science research (2005) and is persuasive enough to make me rethink the place of games in schools and libraries. Of the sixteen learning principles described by Gee (2005), the following four resonated with me as beneficial to a socially inclusive classroom; risk taking, customisation, situated meanings and cross-functional teams. Video games encourage players to take risks and explore. Failure is not the end result but the chance to receive feedback in order to try again (Gee, 2005). Video games provide a safe environment to try out different choices and consider other points of view (Turkay, 2014). Ethical understanding is a general capability in the Australian Curriculum and video games could be useful resources. Many video games allow the player to adjust difficulty levels. The same game could be used within a classroom but differentiated according to the needs of individual students. Students can also customise games in other ways to suit their learning or playing styles (Gee, 2005). For example sounds can be turned on or off. Customisation also assists in managing cognitive load, the mental effort required for a task (Turkay, 2014). Video games could improve vocabulary by situating the meaning of words and language within the context of the game. Verbal and non-verbal cues are contained in images, actions and the dialogue of video games (Gee,2005) and could be beneficial to learners with learning difficulties. Massively multiplayer online games rely on a diverse range of skills from multiple players. Players have the opportunity to specialise in a particular skill and contribute to the game. Enjoyment is often derived by the commitment to a common goal and the affiliation with others revolves around this commitment regardless of individual differences (Gee, 2005). Forums, cheat sites, game wikis are learning communities that evolve when players have a shared interest and are part of a participatory culture (Turkay, 2014). In a socially inclusive classroom problem solving, sharing and discussion could leverage different modalities of expression to suit different students. My concerns about using video games in schools and libraries are beginning to diminish as I become more aware of the relationship video games have with learning theories, learning principles and participatory culture. My next big challenge is to identify games that are suitable for libraries and classrooms. James Paul Gee from New Learning Institute on Vimeo. Last week I perused the most recent NMC/CoSN Horizon Report: 2016 K-12 Edition and identified the trends and developments in educational technology I think are related to game based learning. As you can see from the image below, a significant number of trends and developments in technology could involve game based learning. Of particular interest to me as a teacher librarian are Makerspaces. Makerspaces are found in school and public libraries and can support game based learning, STEM and 21st century skills. With this in mind I intend exploring games throughout this subject that could be included in a library Makerspace. Another area I am interested in exploring is storytelling and games. Writing is a focus at my school this year so this news report How a nonprofit is using video games to strengthen students’ writing skills caught my attention. I feel that this report has clarified the direction I should be heading as a teacher librarian in relation to game based learning. The first few readings of module 1 introduced me to a new language, the language of video games. The language of video games is new to me and there are so many acronyms; ARG, MMO, MMORGP, LARP, COTS, DLG, DGBL, GBL etc. I had to consult Wikipedia on more than one occasion to understand the readings. Video Games have their own literacy and we bring our own experience to them (Gee, 2012, March 21). My experience is limited so I have a steep learning curve ahead of me to understand the ludology (discipline that studies games) and the shared cultural background that people who play games have (Montola, 2012). I think an old fashioned glossary that I can continually add to, created with a newer technology, Google Docs might be helpful during INF541. Mäyrä, F., Holopainen, J., Jakobsson, M., & Montola, M. (2012). Social constructionism and ludology. Simulation & Gaming, 43(3), 300–320. Are digital games being overlooked in ‘digital education’ reform? My personal video game history is rather historical. 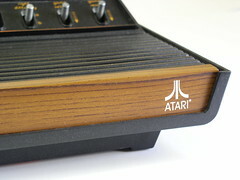 It centres around the early video games of the 1980s; Pong, Space Invaders, Frogger, Pacman and Donkey Kong. As video games developed in the late 1980s I was more interested in music and impending adulthood and lost interest in video games. As a teacher librarian I have watched students play games in the library for entertainment and learning but have not been involved in curricular decisions or been motivated to learn more about game based learning. I was first made aware of game based learning in the 1990s when secondary students were involved in playing the Sharemarket Game . Students were so engaged and rushed into the library to check whether they had made “money” or lost it. The Sharemarket Game demonstrated to me that games with an educational intent could also be highly motivating (Jennings, 2014). I admire proponents of game based learning such as Rebecca Martin (Jennings, 2014) who are willing to integrate games into learning however I feel unqualified to do so. I am not a gamer and admit that up until now I have had little interest in becoming one because I have so many other interests. I am not part of the culture of games (Jennings, 2014) and I don’t speak the language so I feel inadequate. I am out of my comfort zone. I am certainly not anti-games but like Dr Beavis I have some concerns about their affect on learning (Jennings, 2014). I see the potential games have for practicing 21st century skills of critical thinking, communication, collaboration and creativity (Extra Credits, 2014) but believe more research is required. In recent years public libraries have embraced video games and makerspaces to appeal to the community and makerspaces are becoming more common in school libraries too. Professionally I need to up-skill so that I can make informed decisions. The popular media and my own professional reading around digital education is dominated by the word coding. Coding is considered a future work skill by governments and a way of moving students from being consumers of technology to creators (Turnbull, 2014). The focus on technology and STEM may give more legitimacy to digital games for learning and result in more research. do I have to be a gamer in order to embrace games for learning?